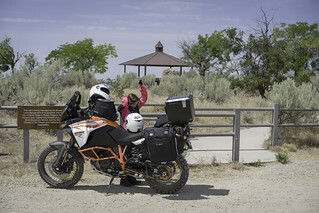 It may be the roughest part of the whole ride but Brenna seemed to like the rocky trail from Boise to Bonneville Point just fine. It’s hot here in the open, on a parched hill overlooking the river valley, so we’re only pausing a minute to make sure our luggage remains well secured. “Can I go look?” Brenna asks, nodding toward the gazebo in the fenced area. She’s been here a few times but doesn’t remember it well.